Available: May 2011 Display technology: n.a. Size: 7.6" x 3.6" x 1.3"
The TI-Nspire Lab Cradle continues the idea of the original Calculator-Based Laboratory™ System (CBL™) introduced already in 1994, a portable and versatile data collection device for math and science. The CBL system was replaced in 1999 with its successor CBL 2, featuring three analog inputs and an ultrasonic motion detector input to connect the Calculator-Based Ranger CBR and its successor CBR 2. The TI-Nspire Lab Cradle sports three analog inputs with a sampling rate of up to 100,000 samples per second and two digital sensor ports. The integrated 32 Mbytes of storage space allow the handling of large amounts of data. 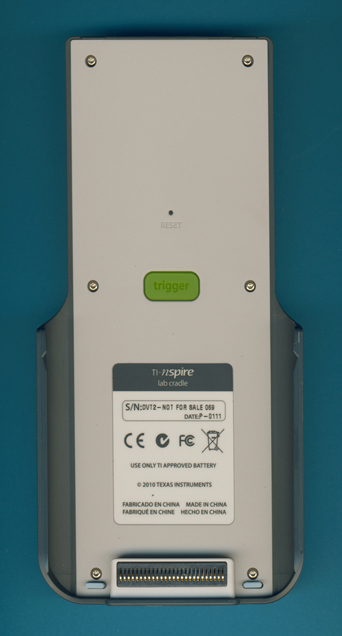 The TI-Nspire Lab Cradle is powered by the TI-Nspire Rechargeable Battery and support three different charging options: wall adapter, USB cable to computer and TI-Nspire Cradle Charging Bay. The featured TI-Nspire Lab Cradle is an early prototype and Texas Instruments asked us not to open the unit. The TI-Nspire Lab Cradle being marketed by Texas Instruments was developed as part of an ongoing business alliance between TI and Vernier Software of Portland, Oregon.